According to Google, the “easiest way to add [G Suite] user accounts is to add them individually in your Google Admin console.” Importing multiple users via a csv file, inviting users by email to create their own usernames and passwords, and other options are also available. These options work just fine for the most basic setups. But they fall short for admins who are managing more than just G Suite profiles. We’re talking about those who are frequently onboarding or offboarding users and also need to provision user accounts for server access to AWS, Google Cloud, WiFi networks, or other IT resources. In fact, G Suite Directory is just a small portion of what IT admins need for their identity management services. G Suite is a critical part of an organization’s overall platform. However, Google’s purview doesn’t really include the on-prem systems, applications, and networks. It doesn’t include cloud infrastructure and applications, either. 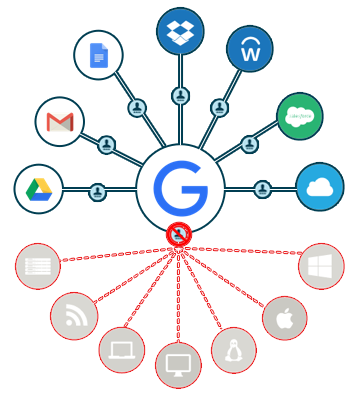 The Google identity management concept only provides a user management system for Google Apps and a select few web applications. G Suite, and the major benefits that it brings to their end users, has excited many IT admins. But they are struggling with how to extend G Suite identities to their systems, applications, and networks. Ideally, end users can leverage their G Suite credentials as their core identities to access the IT resources they need. As most IT organizations have shifted to the cloud, the concept of a central identity – which was relevant in the Microsoft Windows era with Active Directory® – is a struggle for IT admins. A new generation of cloud identity management platform is filling this gap. 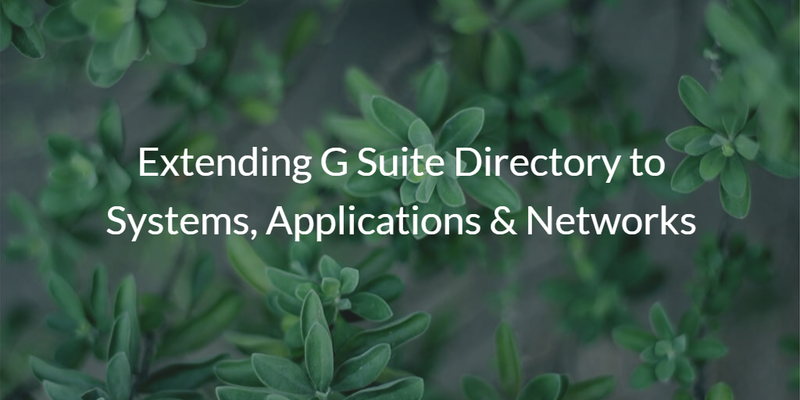 The solution, called Directory-as-a-Service®, is tightly integrated with G Suite and enables IT organizations to leverage G Suite identities as the core for their organization. A user’s G Suite identity can be used to access their laptop/desktop, cloud servers at AWS or Google Cloud, on-prem applications that are LDAP-based, WiFi authentication via RADIUS, and much more. In fact, your organization can extend G Suite identities to be central to the entire IT infrastructure. You can see how our integration with G Suite works in the tutorial video above, but we also invite you to drop us a note if you have more specific questions about extending G Suite Directory to connect with your systems, applications, and networks. 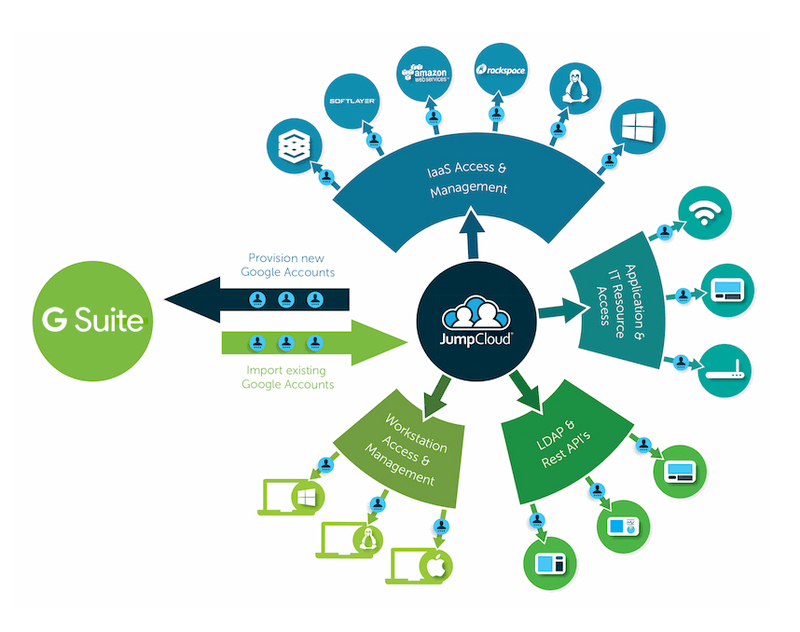 Even better, sign up for a free JumpCloud IDaaS account and get started integrating our cloud directory service with G Suite. Your first 10 users are free forever.